Legendary, intergalactic bounty hunter Samus Aran sets out on yet another mission! But can Team Ninja deliver the game necessary to satisfy what Nintendo fanboys have been enjoying for years? Read on to find out! Metroid: Other M is full of all the exploration, platforming, cool weapons and giant boss fights that you’d want from a Metroid game, but with a dash of Team Ninja’s signature speed. The level of exciting and fast-paced agility that Team Ninja applied to the iron clad heroine, Samus Aran, is honestly a bit jarring at first. Especially if you are hot off the heels of the somewhat more methodical Prime series. But not to worry, because it feels great and becomes very engaging once you adjust to it. 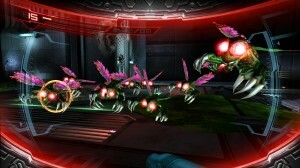 Seeing Team Ninja’s Samus speed boosting through corridors and using her Shinespark, Screw attack, and wall jump techniques is a nice revitalization in comparison to Retro Studio’s Metroid Prime version. And don’t take that the wrong way, I love the Prime series, but after three of them I was ready for a bit of a change up. The different versions of Samus is like the difference between an Audi and a stock car. Retro built her with an emphasis on comfort while Team Ninja had their eyes on speed. Either way, they handle great… The cars, I mean. I’ve heard multiple complaints of people wishing there were an option to use the analog stick of the nunchuck controller rather than the directional pad of the Wii remote (the game is played with simply the remote), but I can honestly say that I rarely had a problem with the way Samus moved. Throughout my time with Other M, I never found myself red in the face or cursing the game for its inability to operate the way I wanted it to. Occasionally, the game’s camera dives in for a 3rd-person, over the shoulder view, which can be a little funky when trying to move Samus, but those instances are always without enemies and deliberately slow, so worrying too much about mobility is relatively unnecessary. In fact, the only glaring problem I had with the controls was the switching between the games primary view and the first-person perspective. Anytime you need Samus to use missiles or do any kind of detective work, you have to turn the Wii remote toward the television. Early on, I constantly found myself struggling to grasp the controller in a comfortable way and would either be forced to awkwardly hold the small remote with two hands, or clumsily reposition my hands causing me to lose time and get smothered by an enemy. Even more annoying is that, once in first-person, you are literally cemented in place, unable to dodge. For a game that demands a quickened pace, the unintuitive swapping of orientations tends to be a hurdle. Though, again, once I spent enough time doing it, I found myself getting into the groove and becoming a more a little more comfortable with it. The auto-dodge mechanic has a similar learning curve. When face to face with an enemy, mashing the D-pad at the correct time will cause Samus to make a quick jump out of harm’s way. Initially, I had some trouble with getting a grip of the dodge. It would have been nice to have the ability to manually do so, but (I’m going to sound like a broken record here) once you get the hang of it, it works well enough. All in all, the controls may have been a bit much for just the Wii remote alone, but it was never enough to make me want to stop playing the game. Team Ninja has a pretty recognizable style. If you have ever played their Xbox or PlayStation iterations of Ninja Gaiden, you’d probably remember the intense use of oversaturated colors and oversized enemies. In a lot of ways, a Metroid game was is a perfect fit for them since there are a lot of opportunities to let the art style take control of the screen. For instance, when fully charged, Samus’ Power Beam blasts an enormous and deadly bloom of color as she lays waste to enemies. 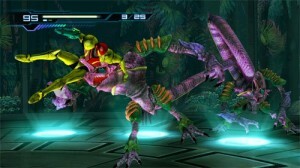 And some of the new alien species scream Team Ninja all the while being true to what you would expect from a Metroid game, like the purple and green reptilian Ghalmanian, or the fire red, tentacled, Chinese dragon inspired Goyagama. It all looks fantastic, too. Other M is one of the select few visually impressive Wii games that I wish all developers could all live up to. As a diehard Metroid fan, one of my favorite things about the series has always been the quiet and isolated tones of the games. 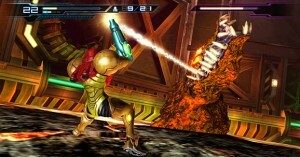 Samus, to me, has always been a stoic and seemingly unstoppable bounty hunter. She was a woman on a mission and rarely stopped to be taken aback or to recollect. She got stuff done. But Other M sort of threw that all out the window by packing the game full of too frequent and lengthy cutscenes that gives too much insight into the world and psyche of Samus Aran. Long story short, immediately following the events of Super Metroid, Samus intercepts a distress signal coming from a nearby Galactic Federation research facility that is almost the exact same setting as the ship you board in Metroid Fusion. Once onboard, Samus needs to find out what was going on on this now derelict ghost ship. Luckily, there are a few legitimately awesome and surprising moments in Other M, but the lesser ones tend to outweigh them pretty heavily. Personally, I prefer the subtle and implicit storytelling of the Prime series rath er than the more traditional method Other M imposes and to make matters worse, the once silent Samus now has a voice so monotonous and droning it can only be described as apathy personified. It’s what I imagine the voice of driftwood to sound like. The rest of the cast delivers a relatively believable performance, but in the end is anything less than memorable. 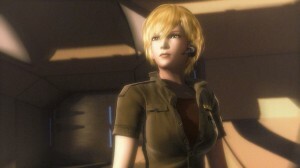 Metroid: Other M kind of feels like it’s Team Ninja’s love letter to fans of the Metroid series. It looks, feels, and plays like a mixture of Super Metroid, Metroid Fusion, and Metroid Prime and, once I got over the control issues and through the story portions that weren’t always worth sitting through, I had a pretty damn good time.